I. Apprising those who are to Take Part. At the conclusion of an audience the Duke 2 sends a retainer to apprise those who are invited to take part in the banquet. 2. Laying Out all the Apparatus and Food. (a) The court steward 3 prepares all the viands for the use of the various officials, to the east of the private apartments. (b) The musicians suspend the bells and the musical stones. (c) The used-water jar and cup-basket are set to the south-east of the east steps, and abreast the eastern rain-gutter.' 4 The jar of water is placed to the east of it, and the cup-basket to the west, all squarely south. The Duke's cup-basket is placed to the north of them, and faces west. wine for the ordinary officers and that to be used at the general feasting is taken is placed to the west of the door, and consists of a pair of round-necked vases. (e) The keeper of the vessels then lays the mat for the principal guest to the west of the door of the room, with its head to the east, but with no second mat on it. 3. Going to their Places. (a) The captain of the archers announces that all is ready. (b) Then a retainer lays the Duke's mat at the head of the eastern steps, facing westward, spreading it in several layers. Then the Duke ascends the steps, and goes to his place on the mat, sitting with his face westward. (c) Then a retainer receives the ministers and great officers, who all enter by the right of the door, 6 and stand inside it, with their faces north, and graded from the east. The ordinary officers stand in the western part, facing east, and graded from the north. The liturgist and the recorder stand to the east of the door, and east also of the others, facing north, and graded from the east. One of the retainers takes his stand below the eastern side hall, facing south, and the ordinary officers who are to take part in the general feasting stand west of the door and face north, graded from the east. (d) The Duke then descends, and, standing to the south-east of the eastern steps, and looking south, invites the ministers to draw near, whereupon they move round and settle themselves, facing west, and graded from the north. Then the Duke does the same to the great officers, and they all advance a little. 4. Appointing the Principal Guest and the Manager. (a) Then the captain of the archers invites the Duke to name the principal guest, and he says : " Let So-and-so have the honour." (b) This appointment the captain of archers conveys to the principal guest, and he, advancing a little, formally declines, this being reported to the Duke. (c) Then the captain recommunicates the Duke's appointment, and the guest kowtows twice and accepts, this being reported to the Duke by the captain. (d) Then the principal guest goes out the door and stands, facing east. (e) Thereafter the Duke salutes the ministers and great officers, who all ascend the steps and go to their mats. (f) Then the retainer, standing below the east steps and facing north, asks the Duke to name the men who shall be the cover-holders, and thereafter to say who shall act as the Duke's waiter. (g) He then gives orders to the cover-lifters, and they, going up by the west steps, stand to the south of the wine-holder, facing north, and graded from the east. (h) Thereafter the Duke's steward invites the Duke to name those who shall serve the dainties to the feudal Dukes and ministers. 5. The Entrance of the Principal Guest. The captain of the archers meets the principal guest, who enters at this stage. When he reaches the court the Duke descends one step and salutes him, inviting him to ascend, and then goes up again and returns to his mat. The principal guest goes up the west steps, and the Master of Ceremonies also ascends in the same way, and, passing to the right of the guest, faces north and bows twice, acknowledging his coming, the guest replying with two bows. 7. The Master of Ceremonies Offers Wine to the Principal Guest. (b) Then the principal guest descends, and, at the west of the western steps, faces east. The Alaster of Ceremonies excuses himself the honour of his company, and the guest replies suitably. (c) Then the Master of Ceremonies, facing north, washes his hands, and, sitting down, takes the drinking-cup and washes it. The guest advances slightly and declines the honour, and the Master of Ceremonies, sitting, places the drinking-cup in the cup-basket, and, rising, responds in suitable fashion, whereupon the guest returns to his place. (d) Then the Master of Ceremonies finishes the washing, and the guest, with a salute, ascends, the Master of Ceremonies ascending also. The guest bows in acknowledgment of the washing, and the Master of Ceremonies, at the guest's right side, lays down the drinking-cup and responds with a bow. of hands is finished, the guest salutes and ascends, the Master of Ceremonies following him, sitting down, and taking the drinking-cup. Thereupon the cover-holder lifts the cover, and the Master of Ceremonies ladles out the wine from the Duke's wine-holder, the cover-holder replacing the cover. (f) Then the Master of Ceremonies, in front of the guest's mat, offers wine to him, and he, at the top of the western steps, bows, and, going forward, receives the cup in front of his mat, and returns to his place. The Master of Ceremonies, to the right of the guest, bows, inviting him to drink. (g) Then the court steward brings forward the dried flesh and hash, and, when the guest has gone to his mat, the steward sets out the stand of dismembered joints. (h) Whereupon the guest sits, and, taking the cup in his left hand, makes an offering of the relishes with his right, afterwards laying down the cup to the right of the relishes. He then gets up, takes the lung for sacrificing, and, sitting down, cuts off the end and offers it, thereafter tasting the lung, rising and placing it on the stand. Then he sits, wipes his hands, and, taking the cup, pours a libation of the wane, gets up, sits at the end of the mat, and sips the wine, leaves the mat, and, sitting, lays down the cup, and bows in acknowledgment of the excellent quality of the wine, takes the cup, and rises, the Master of Ceremonies replying to him with a bow. (?) Then the guest sits down at the top of the western steps, with his face to the north, and washes the cup, rises, sits again, and, laying down the cup, bows, the host responding likewise. (a) The guest takes the empty cup down to wash it, and the Master of Ceremonies goes down also. The guest sits to the south of the used-water jar, and, laying down the cup, rises, and, going forward a little, declines the honour of his company, the host facing east and responding suitably. (b) The guest then sits down, and, taking the drinking-cup, lays it at the foot of the cup-basket, and, after washing his hands, washes it. The Master of Ceremonies excuses himself the honour of this washing, and the guest sits, laying the cup in the basket, rises, replies, and finishes the washing. When he gets to the foot of the steps in going up again, he salutes the Master of Ceremonies, and ascends. The Master of Ceremonies then ascends and bows, acknowledging the honour of the washing with the same ceremonial that the guest used. (c) Then the guest descends and washes his hands, the Master of Ceremonies descending also, and the guest declining the honour. When the hand-washing is finished, the guest salutes, ascends, ladles out wine from the Duke's holder, the cover-holder lifting the cover as before. He then takes the cup and toasts the Master of Ceremonies at the head of the western steps. The Master of Ceremonies, facing northward, bows as he receives the cup, and the guest, at the left side of the Master of Ceremonies, bows as he invites him to drink. of Ceremonies does not acknowledge the honour done to the wine, and, taking the empty cup, goes down and lays it in the basket. (e) The guest then descends and stands to the west of the western steps. Then the captain of the archers takes the guest up again, and he ascends and stands at the inner side of the west inner wall, with his face to the east. 9. The Master of Ceremonies Offers Wine to the Duke. (a) The Master of Ceremonies washes his hands, and also the ivory drinking-cup, ascends, fills it, and, with his face north-east, offers wine to the Duke. The Duke bows, receiving the cup, and the Master of Ceremonies, going down the western steps, faces north at the foot of them, and bows, inviting him to drink. (h) The Duke bows in receiving the cup, and the blaster of Ceremonies, going down by the western steps, faces north at the foot of them and bows, inviting him to drink. (c) An ordinary officer serves the relishes, and the court steward sets out the stand of dismembered joints, going up by the western steps. (d) The Duke makes his offerings with the ceremonial employed by the principal guest. (e) The court steward assists by handing him the lung. He does not bow his thanks for the wine, but, standing, finishes off the cup, sits, lays down the cup, and bows. Then he takes the cup and rises, the Master of Ceremonies responding with a bow, and going to the west steps, where he receives the cup, and, taking it down, lays it in the Duke's cup-basket. 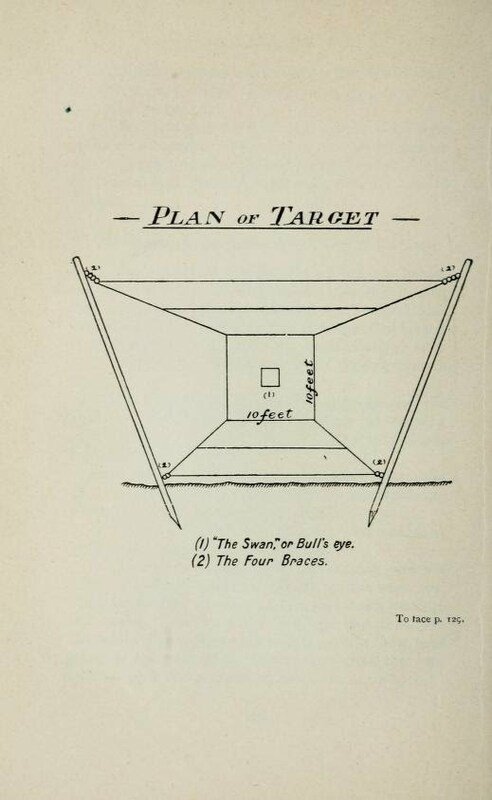 (1) "The Swan" or Bull's eye. (a) The Master of Ceremonies changes the cup and washes it. Then he ascends, and, ladling out wine from the Duke's wine-holder, takes it down, and drinks a toast at the foot of the eastern steps. Then he sits with his face to the north, lays down the cup, and kowtows twice, the Duke responding with two bows. (b) Then the Master of Ceremonies sits, and, pouring a libation, finishes the cup and kowtows twice, the Duke responding with two bows. After this the Master of Ceremonies lays the cup in the basket. II. The Master of Ceremonies Pledges the Principal Guest. (a) The Master of Ceremonies, having washed his hands and the cup, ascends the steps, and raises a goblet to the guest, ladling wine from the ordinary wine-holder. Then, at the top of the western steps, he sits, lays down the cup, and bows. (b) Then the guest descends from his mat, and, facing north, returns the bow. (c) The Master of Ceremonies sits down, pours a libation, and drinks, the guest declining the honour. When he finishes the cup he bows, the guest bowing in reply. (d) Then the Master of Ceremonies descends to wash the cup, the guest descending also, and the master declining this honour, the guest declining the honour of the washing. When the washing is finished, they salute one another and ascend. from the Duke's wine-holder, and the guest bows from the top of the western steps. (f) He receives the cup in front of his mat, and returns to his place, the Master of Ceremonies bowing and inviting him to drink. (g) The guest goes on to his mat, and, sitting, pours a libation, and then places the cup to the east of the relishes. (h) After this the master descends the steps, and returns to his place. (i) Then the guest leaves his mat, and stands to the west of it, with his face to the south-east. (a) A retainer, from the foot of the eastern steps, asks who is to raise the goblet. The Duke commands that the seniors in the lower grade of great officers shall do it. (b) The retainer then sends two of these to raise the goblet. (c) The cup-raisers, at the foot of the eastern steps, both face north and kowtow twice, the Duke replying with two bows. (d) They take their stand to the south of the water- jar, facing west, and graded from the north. Advancing in turn, they wash their hands, and then the horn goblet, ascend by the west steps, advance in turn, and, ladling out cupsful from the ordinary wine-holder, meet to the north of the west pillar, and, going down, proceed to the bottom of the east steps, where they both lay down their goblets and kowtow twice. Then they take up the goblets and rise, the Duke responding with two bows. drink off their goblets, rise, sit, lay down the goblets, and again kowtow twice. They take the goblets and rise, the Duke replying with two bows. Then the cup-raisers take their goblets, and stand ready at the south of the water-jar. (f) The retainer asks the Duke which of the two cup-raisers is to hand him the wine. (g) If the Duke should say let both do it, they go forward in turn, and, laying their goblets in the cup- basket together, kowtow twice at the foot of the eastern steps, the Duke replying with two bows. They wash ivory goblets, and, going up the steps, fill them, and, advancing in turn, sit, and lay them to the south of the relishes, graded from the north. Then they descend, and kowtow twice at the foot of the eastern steps, inviting the Duke to drink. To this he replies with two bows. 13. The Duke Opens the General Pledging on Behalf of the Guests. (a) The Duke sits, takes the goblet that the great officers have raised to him, and, standing up, uses it to pledge the guest, who goes down and kowtows twice at the bottom of the western steps, the Duke ordering a retainer to decline the honour. The guest ascends the steps and completes the act of homage, whereupon the Duke sits, lays down the goblet, and responds with two bows. (b) Then he takes the goblet, and, standing, drains it, the guest going down and bowing again, while the retainer declines the honour on behalf of the Duke. Thereupon the guest ascends again and kowtows twice. replies with two bows, takes the goblet, and rises. The guest, advancing, receives the empty cup, and, going down, places it in the cup-basket. (d) Then the goblet is exchanged for another, which is washed. (e) Should the Duke command it, the goblet is not changed, but is brought back unwashed. The guest ascends and ladles out a cupful from the Duke's wine- holder, descends, and bows, a retainer declining the honour on behalf of the Duke. Thereupon the guest ascends and kowtows twice, the Duke responding with two bows. (f) Then the guest, having obtained permission, takes the goblet, and starts the general pledging at the top of the western steps. (g) The captain of the archers then sends the senior among the great officers to accept the pledge at the top of the western steps. (h) The guest, sitting to the right of the great officer, lays down the goblet, bows, takes it, and rises again, the great officer responding with a bow. Then the guest sits, pours a libation, stands, drinks off the goblet, and does not bow. (i) If it happens to be the Duke's goblet that is used, after this it is taken down and exchanged for another, which is washed, and the guest, ascending, fills it from the ordinary wine-holder, the great officer bowing as he receives it, and the guest bowing as he invites him to drink. (j) The whole body of great officers receive the pledge with the ceremonial with which the host accepts the guest's pledge. There is no libation poured, how- ever, and the last to receive the cup takes it down and lays it in the cup-basket. 14. The Master of Ceremonies Offers Wine to the Ducal and Ordinary Ministers. (a) The Master of Ceremonies washes a cup, and, ascending, fills it at the ordinary wine-holder, offering it to the ducal and ordinary ministers at the head of the western steps. (b) Then the keeper of the sacrificial vessels goes to the chamber, and, rolling up a pair of mats, goes out and sets them to the left of the principal guest, with their heads to the east. (c) The ministers ascend, and, bowing, receive the drinking-cup, the Master of Ceremonies bowing as he hands it to them. (d) The ministers decline the double mats, and the keeper of the sacrificial vessels removes one. (e) Whereupon the relishes are brought out, and the minister, going on to the mat, sits down, and, taking the cup in his left hand, makes an offering from the relishes with the right. Then he pours a libation of the wine, and, not sipping it, leaves his mat, and, at the top of the western steps, faces north, sits, finishes the cup, rises, sits again, lays down the cup, bows, takes the cup, and stands up. The Master of Ceremonies responds with a bow, and receives the cup, the minister going down the steps and returning to his place. (f) When wine has thus been offered to all the ministers, the Master of Ceremonies takes the empty cup down and lays it in the cup-basket. Thereafter the captain of archers leads the ministers up, and they, ascending, go together to the mat. (g) If there be a feudal Duke present, wine is presented to him before being presented to a minister, but with the same ceremonial as if he were a minister. (h) His mat is spread to the west of the eastern steps, facing north, and with its head to the east, but it is a single one. 15. The Second Raising of the Goblet. (a) A retainer again asks who is to raise the goblet, and the two great officers raise it as before. (b) Then he asks who is to hand the wine to the Duke. If the Duke commands that the senior shall do it, the cup-raisers put their goblets into the cup-basket, and one of them stands at attention to the south of the water-jar while the senior gives the wine to the Duke, kowtowing twice at the foot of the eastern steps, the Duke responding with two bows. (c) He washes an ivory goblet, and, going up, fills it, sits, lays it to the south of the relishes, goes down, and joins his fellow at the south of the water-jar. They kowtow together, inviting the Duke to drink, and he replies with two bows. 16. The Duke Begins the General Pledging on Behalf of the Ducal and Ordinary Ministers. (a) The Duke also offers a pledge, taking first the guest or the senior great officer, as he pleases. (b) The pledge-cup is taken to the top of the western steps as before, the last great officer to receive the goblet taking it empty down the steps, and putting it into the cup-basket. 17. The Master of Ceremonies Offers Wine to the Great Officers. receive the drinking-cup, the Master of Ceremonies bowing as he presents it. The great officer sits, pours a libation, rises, and drinks off the cup, not bowing as he does so. Then the Master of Ceremonies receives it, and the great officer descends, and returns to his place. (b) An assistant of the court steward presents the relishes to the Master of Ceremonies, to the north of the used- water jar, with his face to the west. Those consist of dried meat and hash, but there are no joints served. (c) When wine has been offered to all the great officers, then the relishes are served to them. Their place is in line with the principal guest, and to the west of him, graded from the east. When this is over, the captain of the archers brings them up, and they ascend together and go to their mats.